The CEO and founder of Facebook hasn’t been a dad for very long but he’s been extremely public about his adoration toward his daughter. When Mark Zuckerberg and his doctor wife Priscilla Chan became parents to Maxima “Max” Zuckerberg last November the 32-year-old tech billionaire took two months paternity leave from Facebook, one of the few U.S. companies to offer up to four months paid paternity leave. 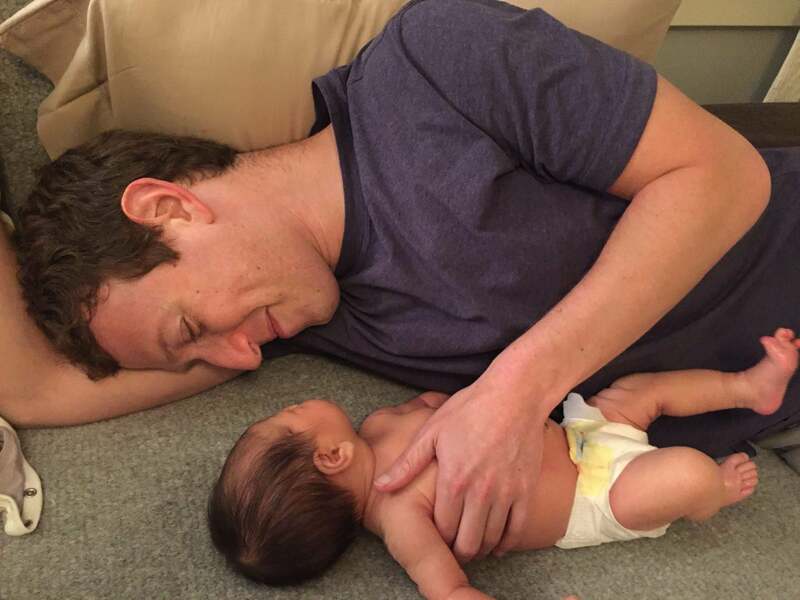 "Studies show that when working parents take time to be with their newborns, outcomes are better for the children and families," Zuckerberg explained at the time in a Facebook post. He also posted on Facebook an open letter to his daughter, in which he describes his hopes of the sort of world he’d like her to grow up in, while also announcing that he is pledging 99 percent of his $46 billion fortune to his joint charitable foundation with his wife. “As you begin the next generation of the Chan Zuckerberg family," he wrote, “we also begin the Chan Zuckerberg Initiative to join people across the world to advance human potential and promote equality for all children in the next generation. Our initial areas of focus will be personalized learning, curing disease, connecting people and building strong communities.” The point of his donation, he wrote, is to move the needle to better the world. While Zuckerberg clearly doesn’t have a lot of free time while helming the biggest social-media company in the world connecting 1.65 billion active users, as of data from March 2016, it’s clear that fatherhood has changed his leadership for the better. It not only has made him want to better the world through his massive reach and fortune, but it’s also enhanced his brand as a Silicon Valley leader, making him more accessible and humanized through one warm-and-fuzzy Facebook post at a time. Here are four more famous entrepreneurs who give fatherhood a good name. Elon Musk is not only the CEO of Tesla and SpaceX, but he is raising a team of children to be the next generation of tech pioneers. Musk is father to five -- that’s right, five -- young boys: a set of twins and triplets. While Musk has gotten some criticism over his quirky and sometimes insensitive behavior -- it was reported in Ashlee Vance’s 2015 biography Elon Musk: Tesla, SpaceX, and the Quest for a Fantastic Future that he once berated an employee for skipping work to attend his wife’s childbirth (a fact which Musk denies) -- it is clear that the South African-born entrepreneur is supremely invested in his children’s education. According to the UK Telegraph, unsatisfied with the schools his kids were attending in Hawthorne, Calif., Musk started his own exclusive school called Ad Astra (Latin for “to the stars”) for his own children and others -- 15 kids in total -- inside a mansion in Mountain View, Calif. run by three teachers he’d handpicked. When billionaire philanthropist Bill Gates stepped down as executive chairman of Microsoft, the company he co-founded with Paul Allen in 2008, he publicly pledged to leave the bulk of his $75.6 billion fortune to charity. It’s obvious that Gates harbors high regard for his own parents, both of whom he’d clashed with as a surly and precocious tech geek growing up in Washington. However, his mother was influential in Gates’ decision to devote his fortune to good works and his father William Gates Sr., a retired lawyer, works closely with his son to help him run The Bill & Melinda Gates Foundation. Like Zuckerberg, Richard Branson is one of the few industrialists who has instituted paid paternity leave -- an entire year -- at Virgin, the company he founded in 1970. While Branson has made headlines for his risk taking and joie de vivre, he is also a father to three children and remains extremely tight with his 91-year-old mother, Eve Branson, a grand dame who works on various charities with her famous son, including The Eve Branson Foundation and International Centre for Missing and Exploited Children. Like many successful business leaders, the CEO of Berkshire Hathaway (worth $65.7 billion) has been a workaholic for the majority of his 85 years. However, it’s clear Warren Buffett’s humble ways and lifestyle left an impression on his three adult children. His 58-year-old son Peter tells Business Insider that his upbringing was very modest and normal, and he didn’t realize the scope of his father’s fortune and influence until he was about 25. "I walked to public school... I had the same English teacher that my mother had… [Finding out] was very gradual ... The truth is, it just wasn't around... We didn't grow up around the exposition of wealth." In fact, by the time Buffett’s children knew about their father’s wealth, they were already formed and developed as adults, says Buffett.